Summer and warmer weather means mosquitoes. Take care now to eliminate the environment that mosquitoes need to live and breed. At Farmers Coop, we’ve got several option to help you win the battle against mosquitoes. 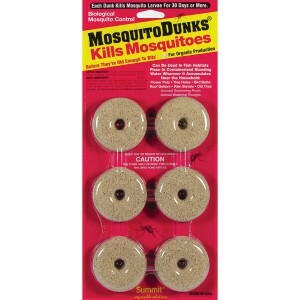 It’s our goal to provide you with products that will help you with Mosquito control. Here are some tips to consider as you prepare your home and yard for summer. Look for standing water, that is where you’ll find mosquito larva. Check your gutters, make sure they are clean and clear from standing water. Care for your lawn. Keep grass short and don’t over-water. Treat your bubblier and French drain lines along with rain barrels and saucers for the potted plants. Promote an environment that combats mosquitoes! Purple martins, bats and dragonflies. Mosquitoes are a favorite snack. Basil: This delicious herb is not only helpful in the kitchen, but basil also is believed to keep away mosquitoes and flies. Mosquito Plant: Yes, that’s the name! Simply water the plant a couple minutes before going outdoors and it helps repel mosquitoes. Lemon thyme: This aromatic herb thrives in sunny, dry conditions, along pathways and rock gardens. For best results, bruise the leaves and rub them between your fingers to release the herb’s essential oils. Catnip: Yes, the cats love this pretty herb, but the mosquitoes apparently do not. Citronella grass: The perennial is the source of citronella oil used in pest repellent and the commonly found mosquito candles. Mint: Place the mint-filled pots around your home to help repel mosquitoes. Or, use the fragrant mint leaves to make an all-natural mosquito repellent. Lemon balm: This member of the mint family has an aroma that is said to naturally repel mosquitoes and other insects. Consider changing your outside lighting to yellow light bulbs or lenses. 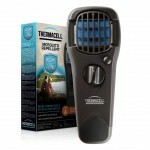 Use personal mosquito repeller such at the Thermacell Repellers. Simply clip on your belt and it effectively repels mosquitoes, black flies, and other biting insects by creating a 15 x 15-foot zone of protection for bug-free comfort. The use of sprays and granule repellents in the environment is an option. Some all-natural sprays include citronella, garlic and orange oil sprays. Granulated cedar and garlic work as repellents. 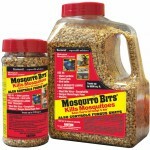 Stop by Farmers Coop and let our experts find right products to eliminate mosquitoes where you live. This entry was posted on Tuesday, May 31st, 2016 at 6:50 pm	and is filed under Garden, News & Updates. You can follow any responses to this entry through the RSS 2.0 feed. Both comments and pings are currently closed.